An experiment that riveted the world: Eighteen-foot tomato plants and cucumbers the size of watermelons made global headlines. But what those newspapers knew wasn’t even half of the epic saga surrounding L. Ron Hubbard’s greenhouse plant experiments, and a breakthrough concerning life itself: how the fundamental postulates of survive and succumb interplay in life and result in the game called “victim.” In the wake of that breakthrough came further discoveries revealing the basic reasons for a being’s postulates of self-destruction, and their solution—Communication Processes sweeping the track clean of core aberrations. Moreover, here’s where application took on a fully massive dimension with the announcement of a new type of auditing enabling one auditor to handle hundreds, or even thousands of preclears at a time. It’s the means to broad scale clearing and planetary salvation. And yet, no matter the magnitude of these developments, standing behind them was something far greater. For here is the historic Congress where Mr. Hubbard first announced the acquisition of the most famous address in Scientology: Saint Hill Manor, East Grinstead, Sussex, England. The goal? Clearing. And not just one individual, but hundreds, even thousands—at the same time. It was 1959. 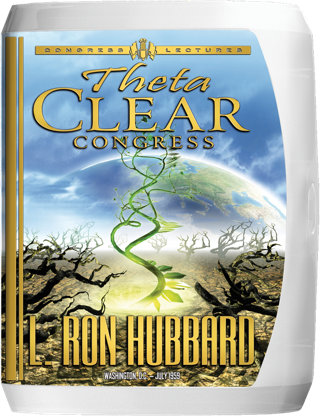 And while the subjects of Dianetics and Scientology had entered their tenth year, L. Ron Hubbard was launching an entirely new era—one that would literally reshape the very image of Scientology, forever. First, and in evidence of the fact that technology had evolved to a very precise workability—indeed, a new plateau—he delivered the Special Hubbard Professional Auditor Course Lectures, in April of 1959, to serve as the primary curriculum for a new Professional Auditor Course. So embracive were these lectures, Mr. Hubbard described them as “the fundamentals of fundamentals.” While in further emphasis that auditor technology had stabilized, those very lectures still stand today as the basic course of auditor training. More to the point, and quite in addition to putting that permanent record in place, he needed that new Professional Auditor Course, right now, to rapidly train auditors for something else he was now planning. Namely, the above target 3—clearing on a broad scale by auditors in general on all types of cases. In fact, the practicalities of widespread clearing demanded it. In terms of sheer numbers, no matter how many auditors he could train, it would never be fast enough if every person had to be cleared one-on-one. What Mr. Hubbard sought was some method of clearing that was “easy, fast, inexpensive,” so that every being could avail themselves of it. The solution lay in co-auditing, wherein two auditors form a team to audit one another. Yet while co-auditing had existed for some years, what he was about to unleash was something else entirely. It followed from the fact that all co-auditing to date was comprised of teams of trained auditors. Yet if he had to train every person to a Professional Auditor level before they could audit another, then nothing would be achieved. The solution? Mr. Hubbard developed an entirely different type of co-auditing, for the new auditor. He called it Muzzled Auditing, since the actions the auditor was permitted to perform were very minimal, therefore requiring little training. But that was only half of the equation. “So what is this? What is this? You think this is new. Yes, yes, very new in its technology and startlingly new in its effectiveness. But it’s not new as an idea. Because this is the way I got lots of auditing hours in, in 1946, 7, 8 and 9. Yes, there was a very “new methodology” and it had everything to do with the legendary final element in this period of research. 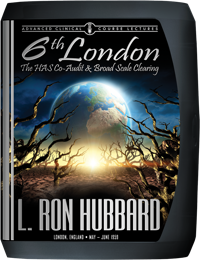 For quite in addition to the hands-on training of auditors in London, Mr. Hubbard had been conducting research somewhere else entirely. And even if Scientologists in general knew nothing about it, he was riveting the world of horticulture with his greenhouse experiments, then producing some amazing results—eighteen-foot tomato plants and cucumbers the size of watermelons. While the press were soon headlining, “Dr. Hubbard’s Atomic Age Laboratory,” and otherwise describing, “a discovery of immense significance to all gardeners,” the fact remains those newsmen didn’t know half the story. For, indeed, here was research into far deeper ground, with pandemic ramifications. And what it unearthed were the basic postulates of survive and succumb, and how one becomes a victim. Hence came not only the mechanics of why life succumbs, but the processes to begin broad scale clearing. Moreover, it was just the beginning. For he had planted something else that would soon sprout a planetwide growth. And if it hasn’t been mentioned so far, it’s only because that’s the way he wanted it.